This world is huge where not a single clan is doing their all to get things done, but this entire environment is the outcome of struggle on part of each one of us. We all are adding to the beauty of the world, we all are doing our jobs to make it going because ‘man is a social animal’ and he cannot stay aloof, some day or the other he has to approach a fellow being for some reasons. Nobody is ‘man-mountain’ on his own, he has to lean on somebody somewhere for something. Whether it be a food related need or it may be pursuit of commodities, no profession is little or bigger, people are earning out of their qualification, experiences and talents. Some of us are more creative in a field while others are good at what they do. Hence it is a total chain which binds us all, and unite us all under the same sky on purpose. What it would have been without trainers? Could we be able to learn and get knowledge? What would be the avail of teachers if there are no students? So it all goes like hand in glove with each other. Where massive businesses are opened up, it is a hard track to make yourself standout, notable and considerable. People spend a lot on advertising their identity, forte and the job they do so more and more people can directly approach them and recognize their stance as early as possible. Roadside posters and hoardings are the best elements to cross the eyes of pedestrians. 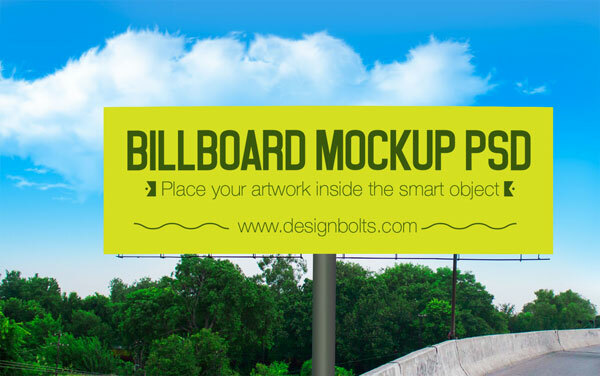 Today I am unfolding before you free Hi Res roadside hoarding mock-up PSD files. You can use these mockups before your clients, just insert your own design and manifest them straight away that how hoarding of a particular product may appear in the most actual form on the roadside. Subscribe us for more free mock-ups. A lot is already coming your way, because our best efforts are done to shortlist the kind of posts that may accommodate you in the long run without a doubt!